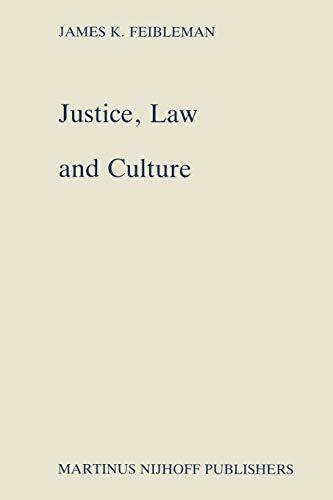 The following pages contain a theory of justice and a theory of law. Justice will be defined as the demand for a system of laws, and law as an established regulation which applies equally throughout a society and is backed by force. The demand for a system of laws is met by means of a legal system. The theory will have to include what the system and the laws are in- tended to regulate. The reference is to all men and their possessions in a going concern. In the past all such theories have been discussed only in terms of society, justice as applicable to society and the laws promul- gated within it. However, men and their societies are not the whole story: in recent centuries artifacts have played an increasingly important role. To leave them out of all consideration in the theory would be to leave the theory itself incomplete and even distorted. For the key conception ought to be one not of society but of culture. Society is an organization of men but culture is something more. I define culture (civilization has often been employed as a synonym) as an organization of men together with their material possessions. Such possessions consist in artifacts: material objects which have been altered through human agency in order to reduce human needs. The makers of the artifacts are altered by them. Men have their possessions together, and this objectifies and consolidates the culture.